W-12 aims to minimize the risks and increase the profitability at the initial project stages for investors worldwide. The platform provides an opportunity for projects to raise funds at no costs without the need for technical expertise by the creation of an environment whereby the project’s path from an idea to a profitable business is very short. The platform vision is to become a significant global platform that can change project fundraising means. The platform will give investors access to the creation of projects based on a new digital and decentralized economy. 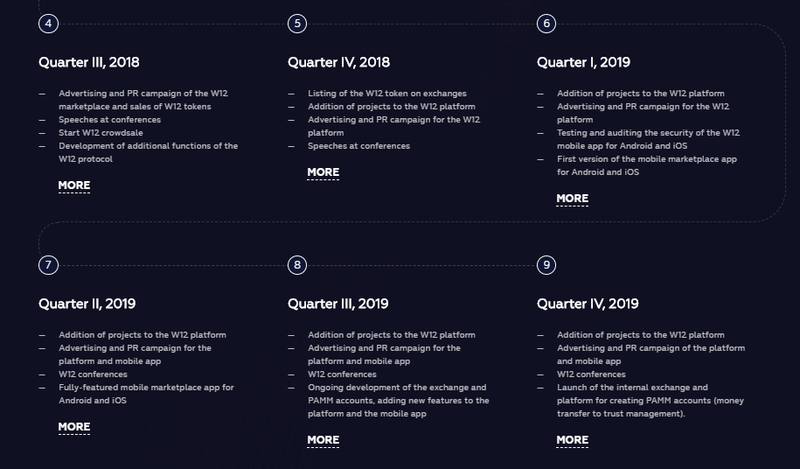 The W12 blockchain protocol allows investors to raise funds through smart contracts only after a stage has been completed on the roadmap. The fulfillment of the stage is confirmed through voting by the investors. A project marketplace where entrepreneurs can test and improve their project ideas. The investors get to choose the best project to invest in and follow the project’s progress on the roadmaps. Experts can also earn project tokens by helping the projects implement their roadmap stages. Content and user reward system. This is a platform where users get to give their feedback on any project on the platform and vote for the ones they want to continue getting funding. In return, they will be rewarded with personal ratings and tokens. A decentralized exchange where projects on the platform will be added to the internal exchange after the token sale. PAMM accounts that can be created by managers to attract investor’s funds. Provides a possibility of limiting the sale of tokens by investors in the early stages on exchanges immediately after an ICO to prevent the drop of token prices by the activation of the token hold function. Simplifies the choice of project investors have to choose from and allows for the transfer of funds to professionals who manage the trusts. Creates an infrastructure that allows for the decentralization of capital and establishes a new standard for safe investment in projects. The token is a utility token that is on the ERC20 standard making it easy for users to integrate it into their wallet. The token gives the users rights to become part of the W12 community. They will also have an opportunity to take part in closed events and invest in the projects that are on the platform. 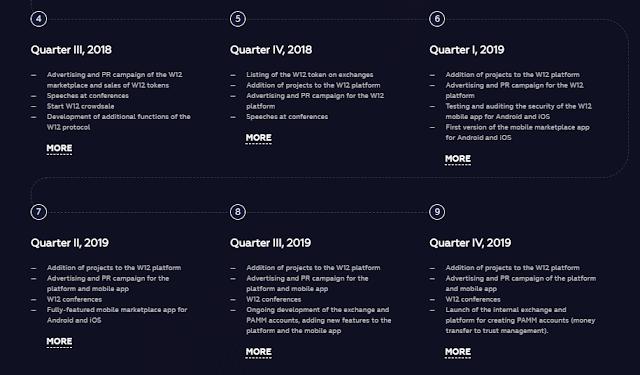 Additionally, the W12 tokens will be used in the smart ICO protocol to store the funds that are raised by the projects. The token is valued at 1W12=0.000015 ETH. Acceptable forms of payment include BCH, ETH, BTC, LTC, XLM, ADA, and ETC. The available tokens will be 10 billion tokens, and 60% of the total tokens will be sold during the crowdsale that will be on 1st July 2018 to 31st July 2018.
financing technical assistance, which has a high negative impact on their implementation.